Sweet Peppers are a favorite home garden vegetable. 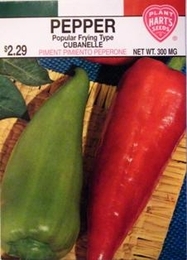 Cubanelle is a large frying pepper, 6" by 12" that may also be used raw on relish platters, in salads, or stuffed. Fruits are light green, ripen to red. Many gardeners hold off heavy fertilization until the first blossom produces a small fruit which is picked off. Pepper plants will bear more fruit if kept picked and not allowed to ripen. Cut instead of pulling from the plant to avoid injury. 4000 Seeds/oz. Plant 1/8oz per 100ft row. 2lbs of Pepper seed needed per acre. 4oz needed per acre if using transplants. On average, 1oz of seed can produce 1500 Pepper plants.